The plot centres on a trio of adopted children and the spinster sisters who raised them. Despite the family's veneer of happiness, closer inspection reveals a clan that's cloaked in secrets. 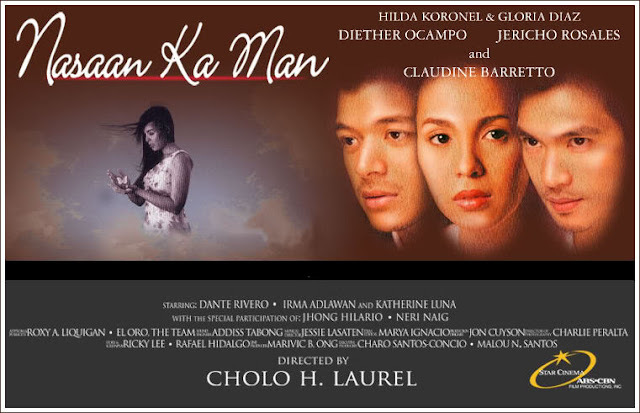 Nasaan Ka Man is a Filipino dramatic love story thriller film written by Filipino, Ricky Lee. It boasts performances by the country’s young leading dramatic actors Claudine Barretto, Jericho Rosales , Diether Ocampo with Hilda Koronel and Gloria Diaz. Noted commercial director Cholo Laurel directs the movie. Set in the mystical and fog-covered outskirts of Baguio, Nasaan Ka Man is a love story about a family shrouded in secrets. As the secrets are revealed, the family learns to let go of their hatred and forgive each other.